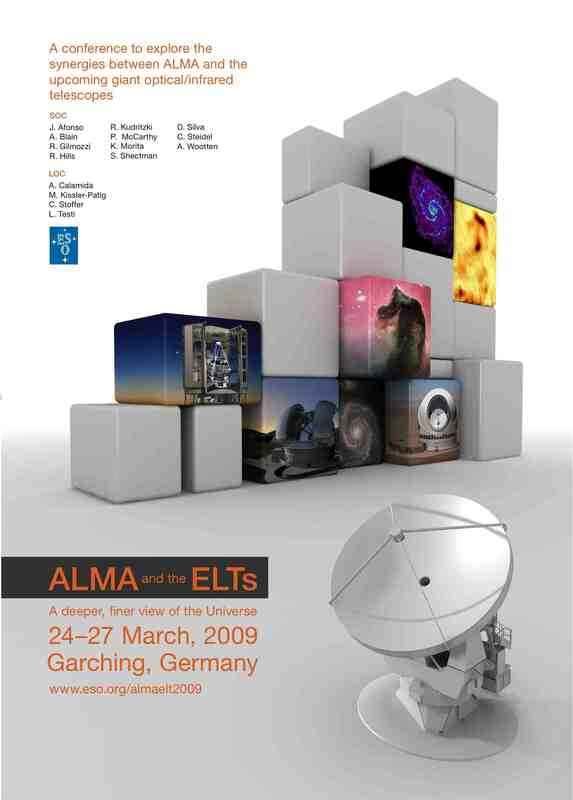 The E-ELT science case has been developed in a series of meetings and conferences (see below) and many people have contributed. Much of the science case development has been coordinated through the EC-funded OPTICON network. Since mid-2012 the E-ELT Project Science Team is responsible for the coordination of the science case. The workshop Science with MOS: towards the E-ELT era will consider the science from current and upcoming MOS facilities, with a focus on the important cases where we are already limited by sensitivity and spatial resolution. It will review the scientific topics that demand future MOS capabilities on ELTs, with emphasis given to the required sensitivity, multiplex, and angular resolution (07 - 11 Sep 2015). The conference Early E-ELT Science: Spectroscopy with HARMONI will explore the E‐ELT's first‐light capabilities, in particular those of spectroscopy with HARMONI, encourage the development of E-ELT science cases including preparatory projects on existing telescopes and provide hands‐on experience using the HARMONI data simulator (29 Jun - 03 Jul 2015). The workshop Speed & Sensitivity: Expanding Astronomical Horizons explored science drivers and concepts for new instrumentation for large telescopes (13 - 16 May 2014). The conference Exoplanet Observations with the E-ELT explored the science cases as well as selected and planned capabilities of the E-ELT in the field of exoplanets (03 - 06 Feb 2014). The conference AO4ELT3 discussed not only adaptive optics technology but also the science that is enabled by AO on ELTs (26 - 31 May 2013). The workshop Shaping E-ELT Science and Instrumentation provided an opportunity to present new science cases, and to update existing ones, as well as to provide input to the E-ELT instrumentation plan (25 Feb - 01 Mar 2013). The workshop Feeding the Giants: ELTs in the Era of Surveys was aimed at exploring the synergies between existing and forthcoming survey facilities and the ELTs (29 Aug - 02 Sep 2011). The workshop Astronomy with megastructures was aimed at developing linked science cases for the giant, next generation telescopes including the E-ELT and SKA, and other key ground and spaces-based facilities (10-14 May 2010). The HTRA-IV workshop considered the potential of High Time Resolution Astronomy with the next generation of Extremely Large Telescopes (05-07 May 2010). The ESA/ESO workshop JWST and the ELTs: An Ideal Combination explored the scientific synergies between JWST and the up-coming giant optical/infrared telescopes (13-16 Apr 2010). The third UK E-ELT Science Workshop Towards first light (13-15 Jan 2010). Extra-solar planets was the topic of the ESO-CAUP workshop Towards other Earths: perspectives and limitations in the ELT era (19-23 Oct 2009). The second UK E-ELT Science Workshop Stellar Populations with the European ELT (17-18 Sep 2009). The first UK E-ELT Science Workshop Exo-planets and Proto-stars with the European ELT (02-03 Apr 2009). The ESO workshop ALMA and ELTs: A Deeper, Finer View of the Universe explored the scientific synergies between ALMA and ELTs (24-27 Mar 2009). 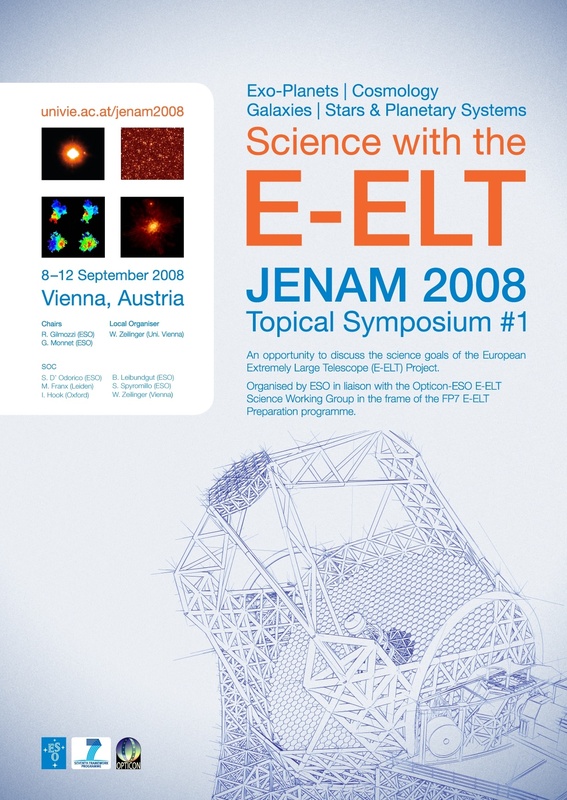 Science with the E-ELT was one of the symposia held at JENAM 2008 (08-12 Sep 2008). The solar system science case for the E-ELT was discussed at this ESO workshop on Future Ground Based Solar System Research (08-12 Sep 2008). At Towards the European ELT ESO presented its E-ELT Baseline Reference Design (see also this Messenger article) to the European astronomical community (27 Nov - 01 Dec 2006). This meeting also included a 1.5 day science session. Details can be obtained from the conference web site. See also this Messenger article for a summary of the science session. This meeting was open to all enthusiasts of ELT science, particularly those who were keen to develop the science case for a 50-100m ELT (08-10 Nov 2004). 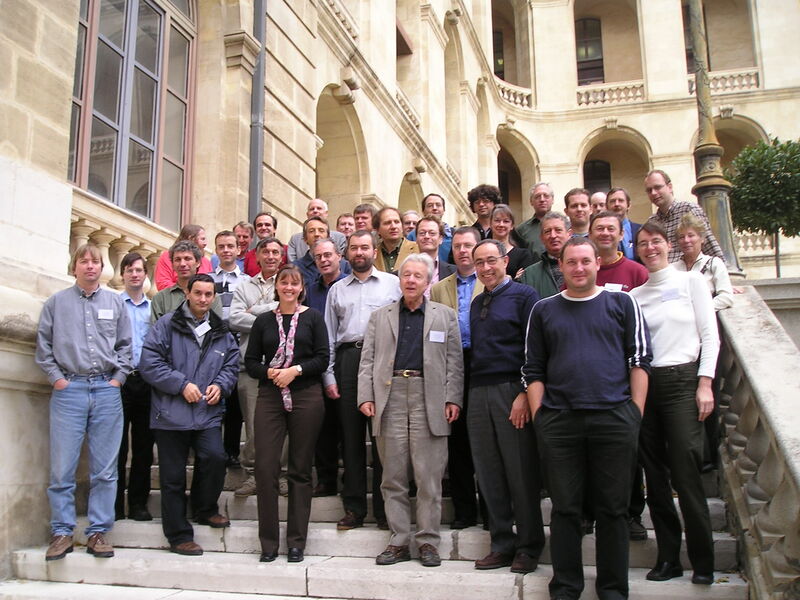 On 17 May 2004 we held the first joint ELT science meeting with the GSMT science working group to discuss the science cases for ELTs and areas where we can cooperate in future. The meeting was timed and located to coincide with the conference Exploring the Cosmic Fontier: Astrophysical Instruments for the 21st Century (18-21 May 2004). This meeting was held to discuss the ELT science case and to plan future work (05-07 Nov 2003). This was a short planning meeting to review the status of the European ELT science case and plan future work (28 Apr 2003).